As a present from Scientific American I got a 2015 calendar. It is made with photographs from the Hubble space telescope. 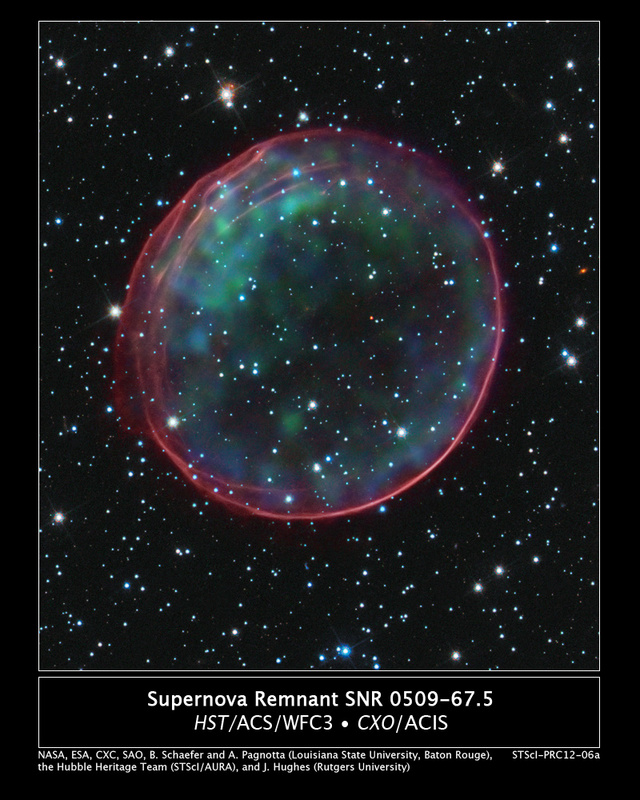 The one for January is a beautiful picture of a supernova remnant (0509-67.5) http://www.nasa.gov/mission_pages/hubble/science/supernova-source.html and shows an expanding ring or about 23 light-years in diameter. Here is the thing: In the description it is mentioned that the super nova explosion took place 400 years ago and located in the Large Magellanic cloud at about 170,000 light years from Earth. I know my wife is always saying that I am not a guy that understand with few words. But it seems to me that the description is taking for granted that we are always making relativistic adjustments to time, because if light took 170,000 years to get here how come the explosion only occurred 400 years ago? I am not a perfectionist and will not try to be, but what has been bugging my mind is how difficult it is for us to have a conversation where time is involved without being careful of keeping track of the frame of reference. So for me, the description should have stated that the supernova explosion occurred 400 years before, not 400 year ago. As we are trying to understand the ultimate reality, as in her recent book Amanda Gefter “Trespassing Einten’s Lawn” tries; we must be very careful with semantics, as our language is limited and our understanding is even more limited. Today we live in a fast paced society that requires of us responses to stimuli at a faster rate. Most decisions are taken based on past experiences and on prejudices. So it is the purpose of education to help us take steps based on information and knowledge that produces good results. The knowledge acquired during formal education is what in professional and trades constitute the context in which the individual performance is evaluated and rewarded. It is in these arenas that the development of so called “Difficult Concepts” is encountered. In my experience the first problem we have is the definition of these difficult concepts. What constitutes the difficulty of a concept. Is it the nomenclature? The complexity? The simplicity? Or the depth of thought? It is clear to me that we have to start with looking at the level of difficulty from the perspective of the level of the individual. What is the previous knowledge that the individual has when presented for the first time with the new concept? Is a question that has to be asked. What is the motivation to learn? As this motivation will give the individual the gumption to invest effort and time in the studying process. Finally, I think, there are external factors like the learning environment, and cultural bias that impede the learning of these concepts making them appear as difficult to the learner. So the question is how can we identify which concepts are difficult, and evaluate the degree of difficulty. I have the feeling that answering this question will lead us into the development of analytical and critical thinking skills.